Eight Miles Higher: From Mod To Brit-Psych: THE ALAN BOWN! 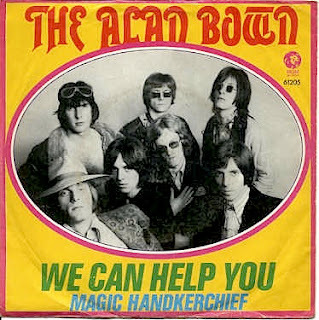 From Mod To Brit-Psych: THE ALAN BOWN! 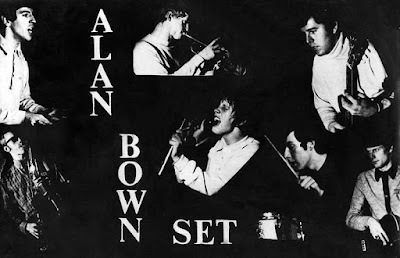 First they were the brass-heavy Mod-cult Alan Bown Set, then they caught the psychedelic wave as The Alan Bown! 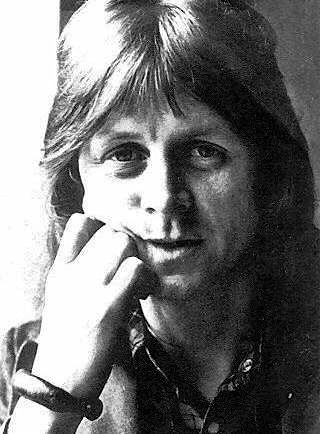 until eventually they were just Alan Bown, evolving from cool jazzy blues through blue-eyed soul and R&B to end up a progressive rock combo. Yet, although the chart visibility of their finest records was minimal, they’re respected for developing and launching the careers of numerous musicians from the mighty Robert Palmer and Jess Roden, to Supertramp and King Crimson via Mel Collins, John Helliwell and Dougie Thomson. Rock trumpet-players are fairly thin on the ground. Herb Alpert doesn’t really qualify. Alan James Bown was born 21 July 1942 in his parent’s front room in Slough, Berkshire. Heavily influenced by modern jazz, he got to see Miles Davis play Newcastle, saw the Joe Harriott Quintet play at Slough’s Dolphin Hotel – while still too young for the licensing laws, and took regular trips the Marquee to catch sets by the Tubby Hayes Quintet and Phil Seamen Band. Following his compulsory National Service RAF stint he joined The Embers as trumpet player in 1963. They were a hard-working live group, with a repertoire based around jazzy R&B, who play venues as far away as the Reeperbahn ‘Star Club’, around the time the Beatles were also in Hamburg. Then the Young Man With The Horn up-gears to join The John Barry Seven in September 1963 – this is after the JB7’s peak as an ingredient of Adam Faith’s chart-topping Pop-formula, and after hits in their own right with their cover of the Ventures “Walk Don’t Run”, TVs ‘Juke Box Jury’ theme “Hit And Miss”, then the Barry-penned “James Bond Theme”. By November 1964 Bown was part of the line-up playing back-up for Brenda Lee, on the French and German legs of her European tour. Marty Wilde was part of the same show, and they back him too. 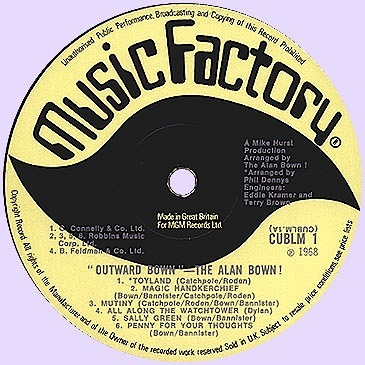 With Barry himself spending more time composing, Bown soon escalates to become leader of the touring band, and seizes the opportunity of cutting his first record with them – the Mod-danceable horns-punching “Twenty-Four Hours Ago” c/w “Seven Faces” (1964, Columbia DB 7414), with vocals by Mike O’Neil, and a slinky Hammond-led instrumental flip. Annoyingly, it’s right then that John Barry imposes three months notice that he’s breaking the band up in 1965, in order to free up more time for his film commitments. 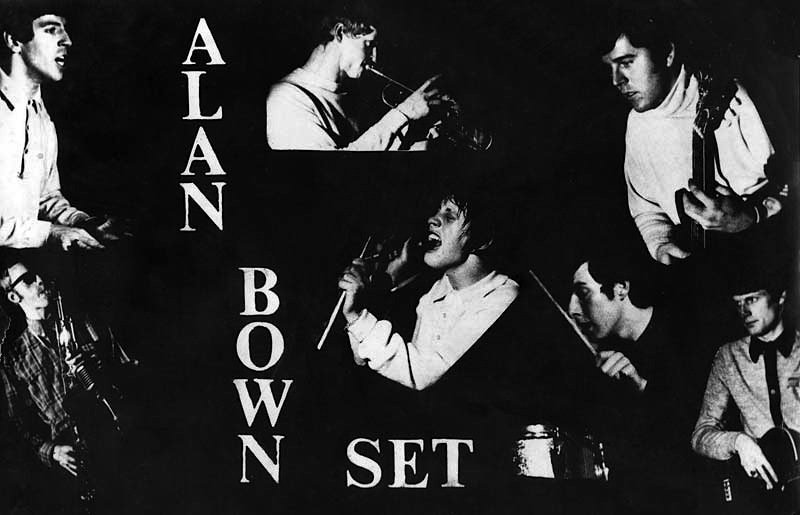 Decisively, Alan took three former members of Barry’s Seven along with him as the basis for the first Alan Bown Set around May 1965 – Jeff Bannister (born 7 January 1943, lead vocals and organ), Dave Green (sax, clarinet and flute) and Stan Haldane (bass), reinforced by Pete Burgess (guitar) and Vic Sweeney (drums). Sounding very much like the bluesy groove they’d achieved on their John Barry single, they build a solid reputation playing R&B and Soul on the same burgeoning Club circuit as Georgie Fame & The Blue Flames and Zoot Money’s Big Roll Band. Soon spotted by Tony Hatch, he signs them to Pye Records, and produces their debut single “Can’t Let Her Go” c/w “I’m The One”. Its jazzy tempo softened by vocal harmonies, it attracts attention, but fails to chart. Alan himself was always the Man With The Golden Trumpet, never front-man vocalist. Like, say, Manfred Mann or Dave Clark, he preferred to influence the group’s direction indirectly. ‘A bright-shirted trumpeter who loves waiting like he loves toothache and kissing his mother goodbye, wanders onto the stage and plays three notes, unaware that it’s now quiet and all eyes are on him…’ according to sleeve-notes. In January 1966 Dave Green was replaced by John ‘John Anthony’ Helliwell, then – a month later, Jess Roden comes in as joint vocalist (from Kidderminster’s Shakedown Sound), allowing Jeff Bannister to concentrate more on keyboards. Together they guest on ‘Ready Steady Go!’ (July), while headlining at Soho’s ‘Marquee’ where Alan had once paid to see top-line bands. On a rainy Sunday bill (31 July) they play ‘The Sixth National Jazz & Blues Festival’ – the first at its Windsor site, alongside The Action, Georgie Fame, Bluesology and one of Cream’s first-ever live sets – with an all-day ticket priced at a modest ten shillings! Their heavy clubbing tour-schedule was boosted into overdrive by the first intimations of just how strong they could be on record, with their tight cover of Edwin Starr’s “Headline News”. Like a street-corner newsvendor announcing to the world’s media about the new Baby he’s found, and – ‘oh what a change in me’, Roden’s raw pleading ‘Extra! Extra!’ is set against high falsetto ‘Read all about it’ call-and-response backing. Roden’s wailing voice can also be heard on the Who’s “Magic Bus”, so it’s not impossible that Pete Townshend picked up and adapted the ‘Extra Extra, Read All About It, Pinball Wizard In A Miracle Cure’ line for ‘Tommy’ from this record. Again, its club popularity fails to yield chart returns, although later it gets rediscovered by Northern Soul devotees as a lost anthem. Meanwhile, the Bown Set are recorded live ‘invitation-only’ with Jimmy James & The Vagabonds, and released as a joint album together as ‘London Swings: Live At The Marquee Club’. 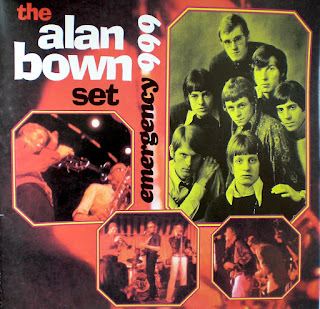 I guess half an album is better than none, and the seven tracks captured on side two – including “Headline News” and “Emergency 999” catches something of the live excitement they generate onstage. ‘Dedicated to those who couldn’t get in, and those who are hooked enough to want to hear it all again’, it’s the only extended recorded evidence left by this phase of the Set’s evolution. 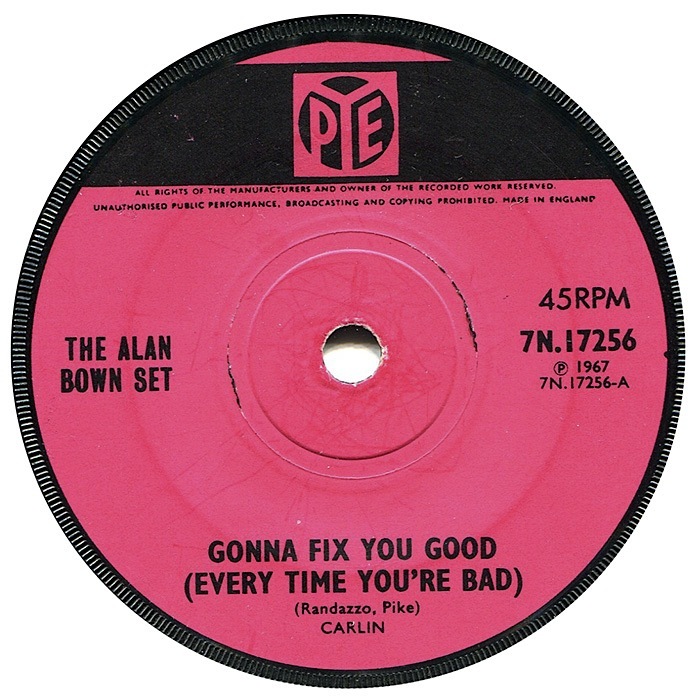 In November 1966 guitarist Pete Burgess is replaced by Tony Catchpole in time for “Gonna Fix You Good (Everytime You’re Bad)” c/w “I Really, Really Care” – although again, it’s a cover, this time of a Little Anthony & The Imperials original, it’s the third of a trilogy of classic club singles that define that era of intense Mod cultdom. Smoother, with keyboard play-in, and an even more forcefully percussive flip, it’s very near the last of the ‘set’. But first they get to contribute to the soundtrack of ‘Jeu De Massacre’ (aka ‘The Killing Game’) a French spy-spoof film scored by Jacques Loussier. Impressively, their kiss-kiss-bang-bang track comes with horn-driven tempo-changes from frantic gunshot ‘you’re dead’ vocal-effects, down to slow interludes. 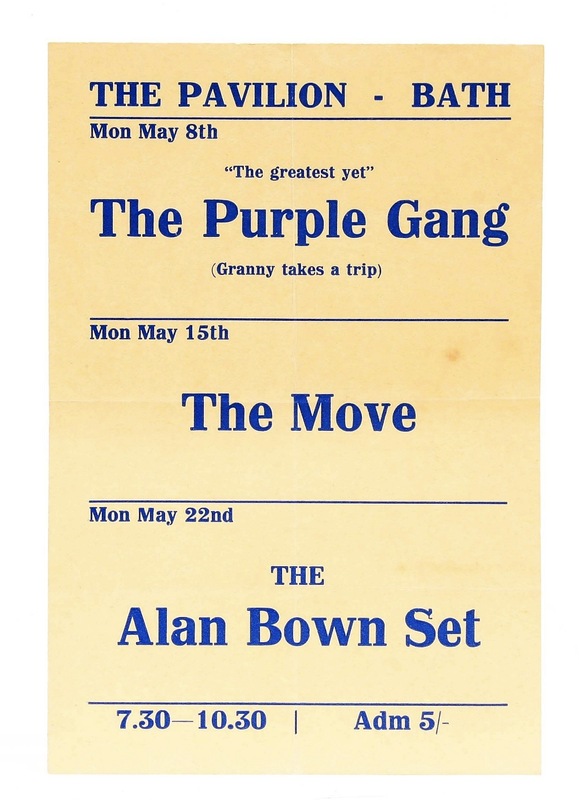 While they’re recording sessions for the BBCs ‘Rhythm and Blues’ programme in 1966 and ‘Saturday Club’ in 1967, Pete Stringfellow promotes the Set at his ‘King Mojo’ club, recalling that ‘in Sheffield we had never seen anything like the Alan Bown Set… Alan’s trumpet was bent at the end, and when I first saw this I thought he had stood on it and broken it’… not so, ‘it was one of the things that helps us remember how talented the band was during this period’ (the introduction to the book ‘The Alan Bown Set Before And Beyond’). They were already fluent musicians, technically accomplished and jazz-literate. 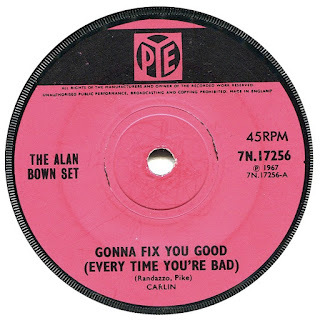 The expiry of the band’s contract with Pye in 1967, offers the opportunity to reform the band as ‘The Alan Bown!’ a more psychedelic concoction for Verve Records. Dropping the ‘set’ and adding the exclamation mark is to denote a career punctuation, because the vibe is shifting, moving away from slavishly replicating cult American R&B, and more about the credibility of originating new material. Zoot Money’s Big Roll Band had metamorphosed into Dantalion’s Chariot. Simon Dupree’s Big Sound were in the Top Ten with “Kites”. ‘We were still mimicking the Americans yet things coming across from the States were moving in different direction – Pop music was growing up’ as Jess explained it. And there’s already a shifting pool of writers within the group, who finally get to release their first full-length album ‘Outward Bown’ in 1967. 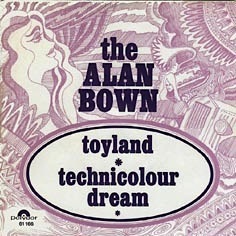 A charming artefact of Brit-psych, both sides start with strong singles – “Toyland” opening with school playground sounds and “Storybook” opening with manic echoplexed laughter, which both capture the gently innovative whimsy and lyrical nursery-rhyme escapism that’s close enough to suggest a hallucinogenic input, yet vague enough to escape censor. Although there’s none of the unsettling darkness of a Syd Barrett, or the hard Freak-beat edge of Creation, the twelve tracks present stronger songs than many of their high-charting contemporaries. 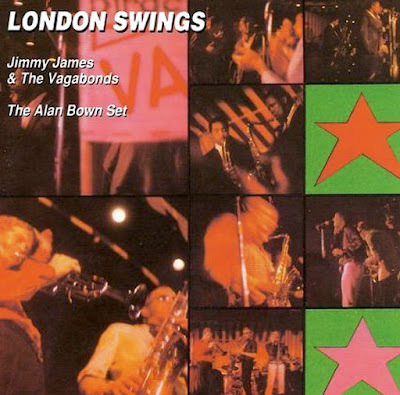 They’re tight and cleanly-produced – ‘things down there aren’t quite so square in Toyland’, decorated with strummed acoustic guitar, woodwind and pizzicato strings, while retaining muted horns on tracks such as “Sally Green” and the more high-energy “Penny For Your Thoughts” which builds to a staccato climax. The slow bass lead-in to the “Storybook” break would later be replicated by 10cc for their “I’m Not In Love”. 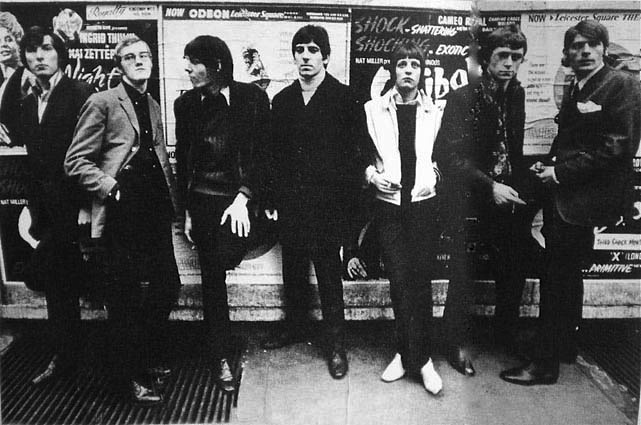 The only two non-originals on the album are a complex tempo-change cover of Bob Dylan’s “All Along The Watchtower” – the stage version of which reportedly ‘directly inspired the Jimi Hendrix arrangement of the song’, and a summery ba-ba-ba close-harmony arrangement of Dion DiMucci’s “My Girl Of The Month”. Promoted by appearances on John Peel’s ‘Top Gear’, it was a well-regarded underground LP at the time, which remains highly collectable vinyl now. It also marks the start of a second run of perfect little singles, the third of which – “We Can Help You” rises all the way to no.26 in the UK chart – but only in the ‘New Musical Express’, so no use looking for it in your ‘Guinness Book Of Hit Singles’. Rejigged from a track on the original Nirvana’s ‘The Story Of Simon Simopath’ (1967) album, with the lyrical addition of an anthemic ‘Happiness Society’ chorus enhanced by baroque twiddly string breaks, it enters at no.29, 24 August 1968, to peak the following week in a chart oddly headed by Tom Jones’ “Help Yourself”, with trumpet-playing Herb Alpert at no.3 with “This Guy’s In Love With You”. It earns them a ‘Top Of The Pops’ slot (8 August), but a strike at the pressing plant determines they’re unable to capitalise on the exposure. 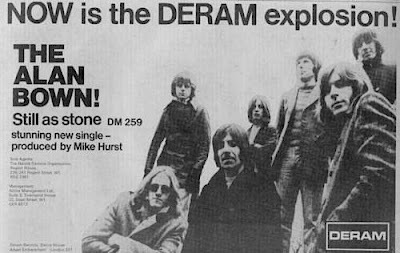 In 1969 they label-switch again, to Deram Records yielding a minor hit with “Still as Stone”, swirling a ‘test-tube of life’ fronted by effervescing-strong guitar and Jess Roden’s most roaring vocal. ‘The Alan Bown! 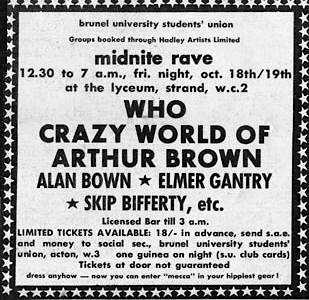 are without a doubt one of the most exciting live acts ever to raise screams from a delirious audience’ enthuses the press-ad, and ‘this is about as alive as a record can get without actually leaping off the record-player!’ It was backed up by lucrative radio dates. 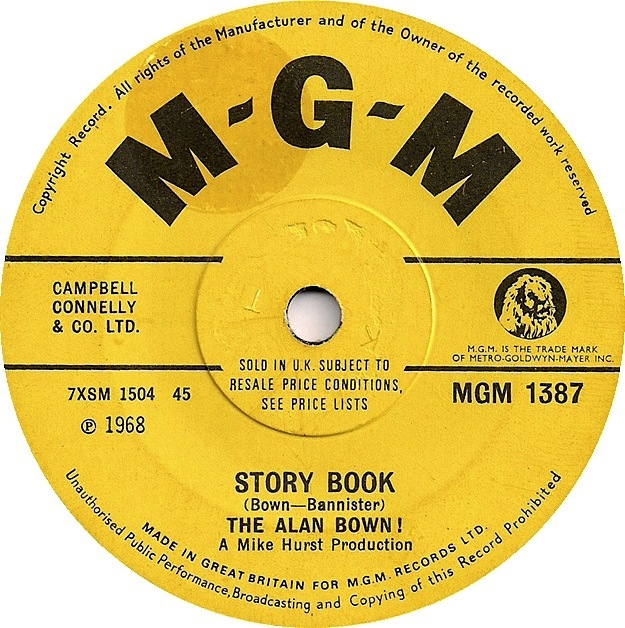 As the BBC was subject to restricted needle time – requiring ‘live’ performances between the records, the Bown were among a select roster of bands who record cover sessions for the BBC, appearing on the ‘Jimmy Young Show’, ‘The David Symonds Show’ and others. They could be seen on Alan Freeman’s fast-moving TV ‘All Systems Freeman’, as well as spots on the Simon Dee and Eamonn Andrews chat-shows. 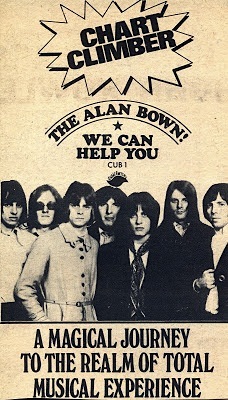 There’s a continuing confusion concerning their next album ‘The Alan Bown!’. Roden told journalist Chris Charlesworth ‘I just couldn’t get into what Alan was doing. I was writing my own songs all the time and getting too involved in that.’ So ‘I left Alan Bown because I wanted to do something of my own’ (‘Melody Maker’, August 1970). So snappily-dressed Robert Palmer is hastily drafted in from the Scarborough-based Mandrakes. 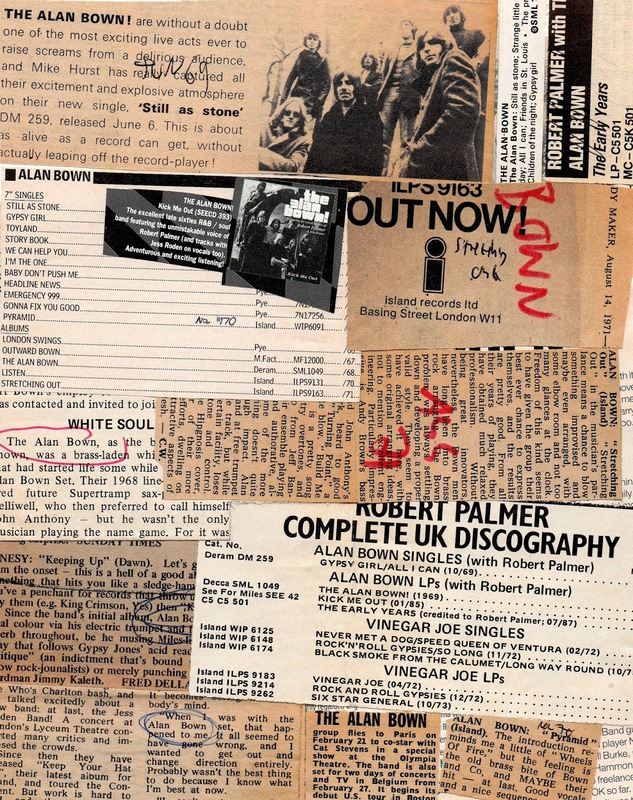 With tracks initially recorded before Roden left, Palmer’s voice is promptly over-dubbed (save those tracks Roden had co-composed), in time for the album's UK release. But not before the Roden vocals had escaped, to be issued as the American LP. Hence, two overlapping versions continue to coexist. Nevertheless, the ambition is seldom in doubt. 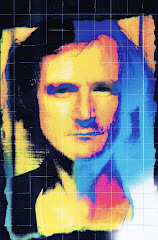 “The Prisoner” is a ten-minute segmented narrative track fading in like the primal detonation of the cosmos, moving through a soft ‘Whiter Shade Of Pale’ sequence into screeching vocals, choral passages and rocking guitar, until the narrative ends with the Prisoner’s release into freedom. The new line-up is boosted by an appearance on BBC TVs ‘Disco Two’ (an early version of ‘The Old Grey Whistle Test’). 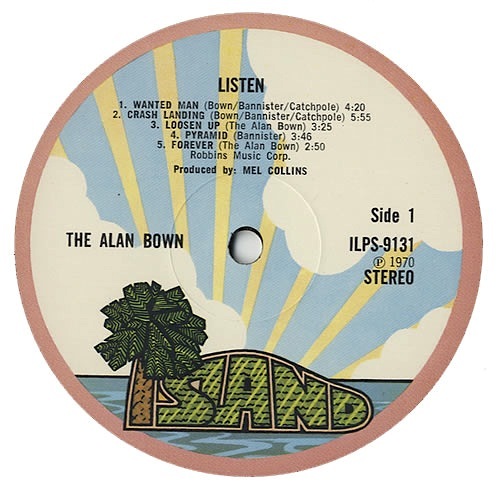 1970 brought fresh changes, the seven-piece band jump labels yet again, this time to Island. And Palmer quits just as they’re recording the album ‘Listen’. 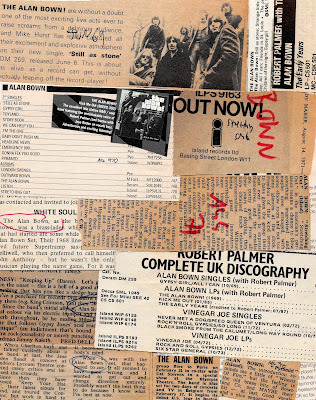 Recalling Jess Roden’s treatment, Fred Deller points out with some satisfaction that ‘later Palmer was to suffer the same indignity when tracks HE recorded with Bown were scrapped and replaced by those made by his vocal successor’ (‘NME’ 20 February 1988). And yes, new singer Gordon Neville re-records the vocal tracks before the album’s eventually release. 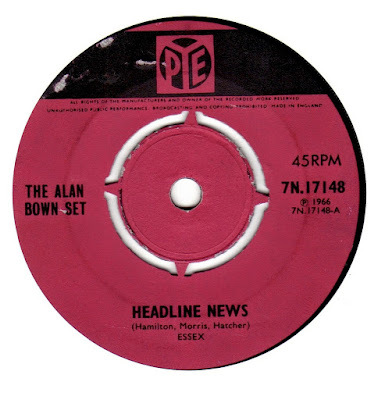 Then the spin-off single “Pyramid” is released just before bassist Andy Brown replaces long-term member Stan Haldane, and Mel Collins is drafted in on sax. ‘The introduction reminds me a little of ‘Wheels Of Fire’’, enthuses ‘Melody Maker’, ‘but the feeling is the old brass bite of Bown and co, and MAYBE their hit – at last.’ For the album, there’s a punchier more prominent horn presence, contemporary with the complex Blood Sweat & Tears or Chicago arrangements, the steaming largely-instrumental “Make Up Your Mind” opens and continues with torrid free blowing throughout, while “Crash Landing” slots easily into new smooth jazz-literate proggy improvisations, with meticulous horn section fills around the keyboards and long meandering soloing passages. They’d come a long way, influenced by fashion-shifts, but always retaining a smart distinction. And there would be one final album, ‘Stretching Out’ (1971), promoted by a re-appeared on ‘Disco Two’. As the title suggests – ‘stretching out in a new direction’, it’s a looser more jazz-rock approach, with more slick soloing. Not a new development, obviously those elements have always been there, but given free reign in a more progressive context. Both the title track and “The Messenger” extend to a full eight-minutes, tightly arranged with duelling brass and Bown’s most prominent horn solo ever, recalling Ian Carr’s work with Nucleus. While “Find A Melody” is built around a noodling jazz-riff worthy of – say, Steely Dan. “Build Me A Stage” has a similarly appealing wistfulness, ‘build me a stage and I’ll sing for you…’ adding ‘if you want me to.’ There’s a sense of summing-up, of end-statement here. ‘Build it right here and I’ll play for you’ adding ‘the best I can do.’ Well – they’d done all that. But it was a period of rapid line-up changes. Jeff Bannister – who’d been there since the JB7, left, but was not replaced, then Dougie Thomson replaces Andy Brown and Derek Griffiths – formerly with The Artwoods, replaces Catchpole. This line-up remained more-or-less stable until February 1972, when Bown presses reset, and forms a new band with Dave Lawson (keyboards) Tony Dangerfield (bass) Frank White (guitar), replaced by Pete Goodall – formerly with Thunderclap Newman, Nick Payn (tenor sax/ flute) and Alan Coulter (drums). 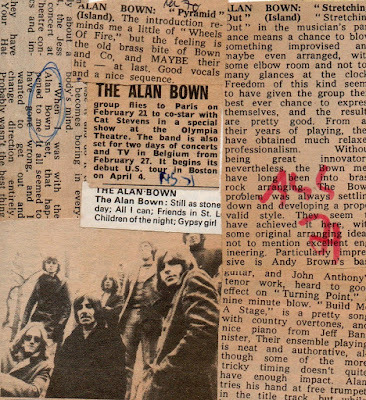 It was to be the last hurrah, after a major tour, Bown finally disbands the group in July 1972. Yet the musical strengths and potential were evident in future developments. 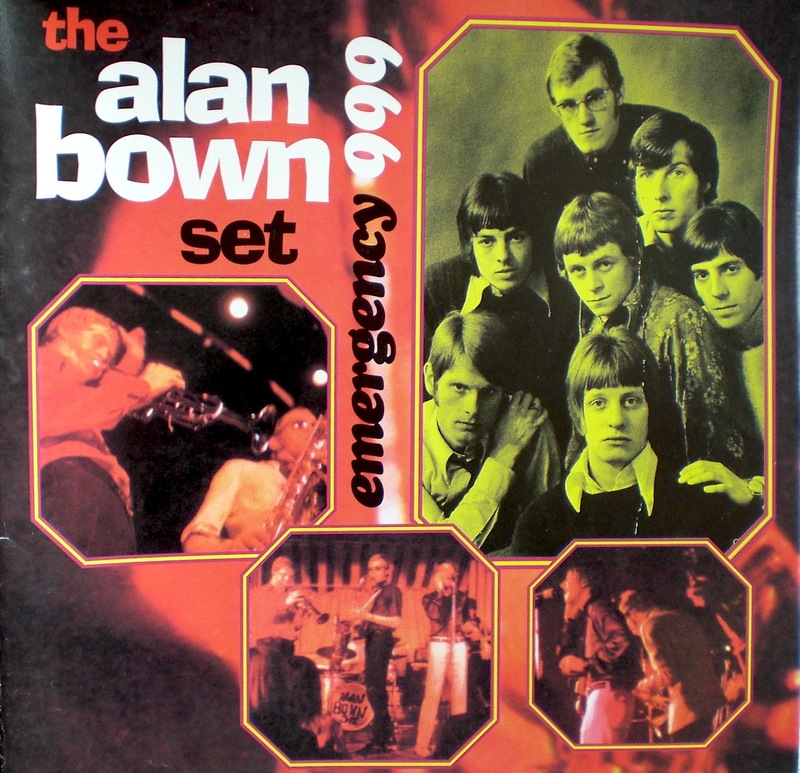 Alan himself – playing flugelhorn or Miles-like on his Super Olds trumpet with Gardinelli mouthpiece, joins Jonesy, with Fred Deller reviewing the five-piece’s third album – ‘Growing’ (February 1974, Dawn) with ‘Alan Bown has at last found the right niche.’ Yet an unobtrusive line hidden away in ‘NME’ in July 1974 notes that he’d graduated from performer to become CBS A&R manager. A position that nevertheless affords him the opportunity of producing a 1977 LP for Gold, formed by ex-Jonesy keyboard-player Jimmy Kaleth and drummer Richard ‘Plug’ Thomas. Melvyn ‘Mel’ Collins become sax-of-choice for King Crimson (from ‘Lizard’, 1970), Camel and numerous other bands. He even plays the sax solo on the Rolling Stone “Miss You”. John Helliwell and Dougie Thomson join Supertramp in time for their breakthrough ‘Crime Of The Century’ (1974) album. Gordon Neville later joins Elton John's band, and works with Rick Wakeman. Vic Sweeney works with Kevin Coyne. Pete Goodall works with Percy Sledge, Viola Wills, Carl Douglas and many more. Nick Payn plays in Bill Wyman’s Rhythm Kings. While the two vocalists both make significant marks. Trailered by a track on the ‘Bumpers’ low-price double-album sampler, Jess Roden with Jeff Bannister form highly-rated country-rockers Bronco, reuniting Jess with ex-Shakedown Sound members, before Jeff moved on to A Band Called O. After recording two albums for Island records (‘Country Home’, 1970 mixed by Paul Samwell-Smith, and ‘Ace Of Sunlight’, 1971), Bronco get derailed by a serious US West Coast autowreck, after which Jess joined ex-Doors Robby Krieger and John Densmore for the Butts Band, then records a fine New Orleans album with Allen Toussaint. Never playing to his obvious strengths, through subsequent ventures he remains a respected vocalist with a strong fan-base, while never quite on the scale of Robert Palmer. Palmer joins Dada alongside Elkie Brooks, shortly before they evolve into Vinegar Joe, which became a springboard to his own transatlantic solo success. Alan Bown died 16 December 2014, in Slough, by which time the various incarnations of the bands bearing his name were reaching new audiences through a series of fine CD reissues. 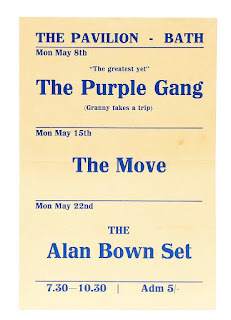 Alan Bown were longstanding favourites at The Place, in Hanley Stoke-on-Trent in the late 60s early 70s.